Chairman of the company Sheikh Daij bin Salman Al Khalifa said revenues for the 10-month period from January to the end of October amounted to approximately $133 million. Ship repair operations yielded a 13 per cent increase over the same period of the previous year, partially making up for the downturn witnessed by marine rig repair, while revenue for new construction and engineering also increased. “Operation-wise,” he continued, “the company maintains a high overall number of vessels with 201 ships being repaired during the period against 146 ships in the same period in 2014, an increase of 37 per cent. The repair of military ships also grew and the company is making good progress on a landing craft for the Bahrain Coast Guard, which is scheduled for delivery in June 2016. “The company has also succeeded in reducing all operational, manpower and administration costs during this period compared to the same period of last year,” he added. Up to August 2015, the Ship Repair division contributed 69 per cent of the total turnover, Offshore 29 per cent, and New Construction and Engineering approximately 2 per cent. “The split is an indication of the changes taking place in the Offshore repair market, which is feeling the effects of global oil price fluctuation. However, the contribution from Offshore increased towards the end of 2015, and so the year-end split is expected to be more balanced,” Berge said. The chief executive commented that competition has indeed increased in the Gulf and at a time when the average maintenance spend-per-vessel has decreased. “We are treating the current modesty in repair scopes not as a passing phase, but as the new paradigm for marine vessel repair. New regulations in the industry have lessened the previous trend of older vessels requiring large repair projects as ships have shorter lifespans, tankers in particular. The average age of the global fleet is decreasing, and we see that reflected in our docks; younger ships, generally with lower maintenance requirements,” he said. “However, there are naturally more vessels in the global fleet, so the challenge is to compensate the decrease in spend-per-vessel by attracting more vessels. Our strategy is based on that challenge. One of the interesting projects of 2015 was the installation of a 75 t Liebherr deck crane on the OSV Rimthan II with all engineering calculations, design analysis, and subsequent reliability verifications; and the sponsoning of a Derrick Laying Barge, DLB-1600, from 31.7 m to 40.3 m wide in only 45 days requiring pre-fabrication in-yard of the sponsons. 2015 was also the year that Asry re-launched its newbuild programme with a $2.8 million agreement with the Bahrain Coast Guard to design and construct a new landing craft for the transport of vehicles, potable water, and fuel. The craft, potentially the first of two, will be delivered in H1 2016. Progress is currently on schedule with steel-cutting almost complete and keel-laying and erection ceremonies already completed. About Project Jupiter, Berge said its influence over the course of 2015 had been very valuable in educating current and new customers about the breadth and depth of on-site specialist contractors at Asry. “Through a careful vetting process we are continuing to add more global names to the list, ensuring our customers have the best selection of contractors on hand to complete their repair projects as fast as possible,” he said. Project Jupiter was launched in 2014 to build the Arabian Gulf’s largest cluster of onsite specialist contractors at Asry. 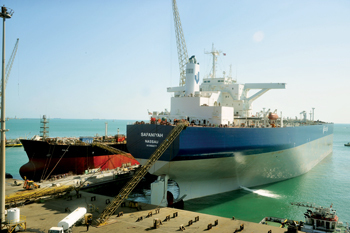 Dwelling on the company’s focus in the New Year, Berge said the current market status was not expected to change dramatically over the first half of 2016 with demand for ship repair and maintenance remaining at a good level and offshore demand relatively lower, although the yard does see some signs for increased repair/upgrade projects. “Should negotiations continue to progress well, we also hope to have an increase in new construction projects in 2016 as well,” Berge concluded. Founded in 1977, Asry’s facilities include a 500,000 dwt drydock, two floating docks of 252 m and 227 m in length, 15 repair berths with a total length of approximately 4,000 m, twin 255 m slipways and a full range of workshops and service centres. 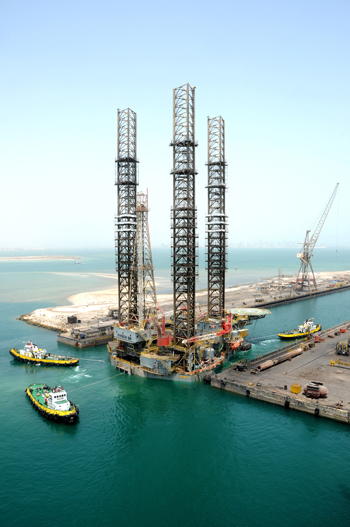 The yard’s portfolio of capabilities includes jack-up rigs and other offshore assets, due to a dedicated division – Asry Offshore Services. Combined with a series of other diversifications including the Asry New Construction & Engineering Division for marine engineering packages, Asry is a multi-functional marine services hub committed to providing international standards to global shipowners operating in the Arabian Gulf.